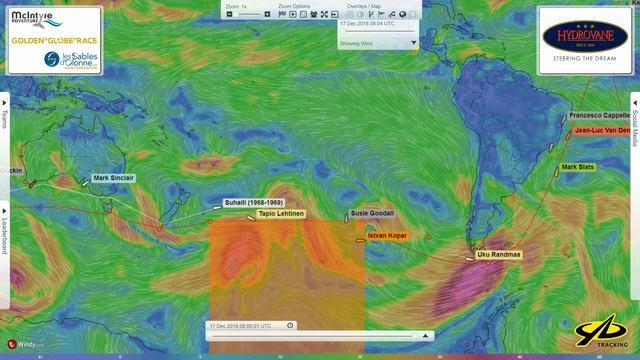 UPDATE.. Istvan Kopar Solo Circumnavigator is sailing straight into a fast forming storm cell that is now moving more south down in front of him. He has been advised to sail south for 18 hours letting it pass ahead. The map shows wind in 15hrs and he should be at the bottom marker then. Mark Slats is driving to windward in moderate seas with 2-3mtr beam seas and plenty of water over the deck! He has blown out his companionway dodger. It is also too rough to call as he will be healing hard and he usually makes the call from inside the orange dodger but now must close the hatch. Tapio Lehtinen Sailing is in strong winds and sitting in his hatch dome using his steering pedals to assist the Wind Pilot self steering gear in fast sailing conditions but the barnacles are still dragging! 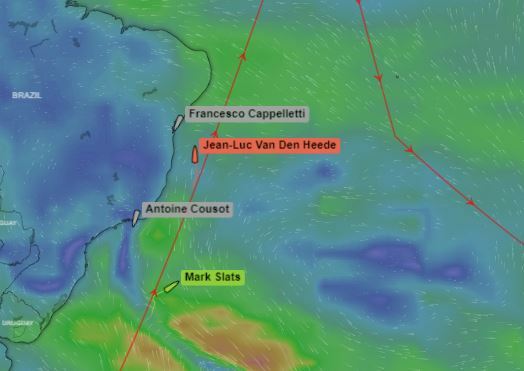 If Mark slats has certainly become a serious threat since Jean-Luc Van Den Heede's mast damage, the leader does not drop anything. This weekend, he even slightly extended his advance, thanks to a slightly more favourable winds. 800 miles now separate the first two competitors of the golden globe race 2018, and it seems that this gap is dedicated to Oscillate throughout this atlantic ascent. 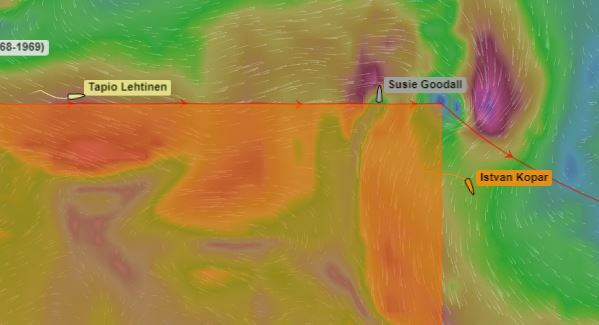 The next few days will obviously be at the advantage of the race leader who will benefit from a slightly more favourable angle (through) that should allow him to pass the tip of Recife, off Brazil, without being forced to fire while his Chasing will have to compose with face winds for at least two days. Since then, business has returned to normal but Slats has to endure another 500 miles of northerly winds before beginning to experience the Easterly air flow now benefitting Van Den Heede 13 degrees to the north. These head winds gave Van Den Heede equal concern at the end of last week when the pounding even in moderate conditions, extended the crack in Matmut‘s aready damaged mast. The 73-year old Frenchman was forced to climb the mast a sixth time to reinforce the temporary binding that is all that holds the lower shroud attachment points to the spreader above. Now that he is back to reaching across the winds, all seems OK for the moment, but he knows that to finish, he must sail very conservativly. Fourth placed American/Hungarian Istvan Kopar has repaired the failing bearings within the steering pedestal aboard his Tradewind 35 Puffin, and having successfully dodged the storm that threatened to overtake him last week by heading south into the NO-GO Zone, now faces the prospect of running the gauntlet before another low pressure system in 3 days time. This one threatens to be the biggest storm to-date with 60-70 knot winds and 12-15 metre seas. Race HQ has advised Kopar to thread his way south of the first small storm but not drop below 53S latitude before December 20. 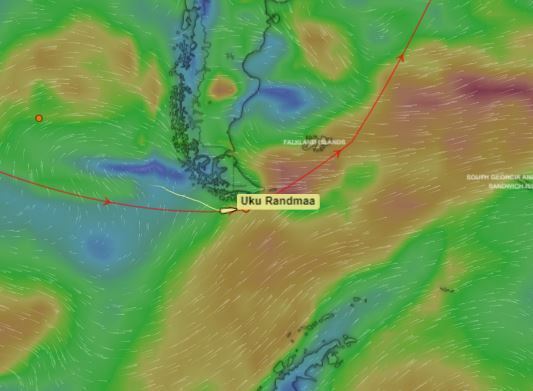 Finland’s Tapio Lentinen whose Gaia 36 Asteria remains covered in barnacles and trails in 5th place among the Glolden Globe racers some 6,300 miles behind the race leader, has a solid breeze in typical southern Ocean weather for now and will have been buoyed by the fact that he has taken 102 miles out of Jean-Luc‘s lead over the past week.